2008 Xiaguan - FT "Yun Mei"
I come to bury Xiaguan, not to praise them. Oh, 500g cakes. With your weighty splendour - whenever did one of these massy beasts turn out to be anything other than disappointing? And yet, I run ahead of myself. Xiaguan, purveyors of decent factory pu'er since time immemorial, now experimenting with all manner of concoctions - which of your many cakes are we supposed to enjoy? You spoil us with choice, and offer us no clues, for the gamut costs approximately the same throughout. Which are your good teas? 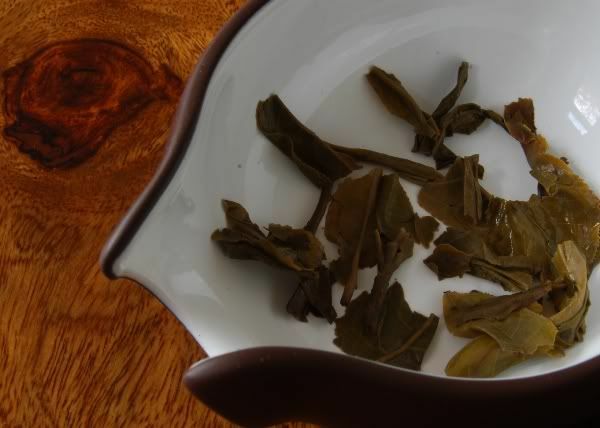 Is this Yun Mei [cloud plum] a good tea? Have the madmen taken over the asylum, and five hundred "special" varieties produced every year without differentiation? If fans of Xiaguan can exist, then I consider myself among them. Perhaps not entirely given over to their mass-produced, yet very decent, operations, I do love that "Xiaguan character". After experiencing so many of their minor variations on a theme, I feel that I have come to understand that theme - though due to nothing more than sheer, bloody-minded exposure. If I were to say "this cake doesn't cost much, at $23", or "it's a special run created for the FT company of Taiwan", it would mean little, given that so much of the interesting output from Xiaguan is in the same category. If not FT, then XY, or somesuch other, but you understand. Drinking Xiaguan is now something of a sport. It is an endeavour in trying to spot the tiny nuances that may or may not exist between any particular cake and the rest of their (sizeable) annual catalogue. What, then, of the Yun Mei? Shown above, I think you'll agree that it looks like a Xiaguan "special" cake. The leaves are small, they're quite tight (this is a tiebing - iron pressed, directly in the hydraulic mould without a sackcloth covering), and they have a sweet scent that neither impresses nor disappoints. For a tiebing, the leaves come apart surprisingly well. I did like the 2008 Xiaguan XY 8853. That was good Xiaguan. Perhaps unfortunately for this Yun Mei, that 8853 remains in my memory, and the current brew seems a bit thin by comparison. "Cloud Plum" indeed. I thought that this name was picked just because of the silly little daisy imprints in the tea-mould, but the tea itself is very floral, delicate, sweet... rather like classic Nannuo. 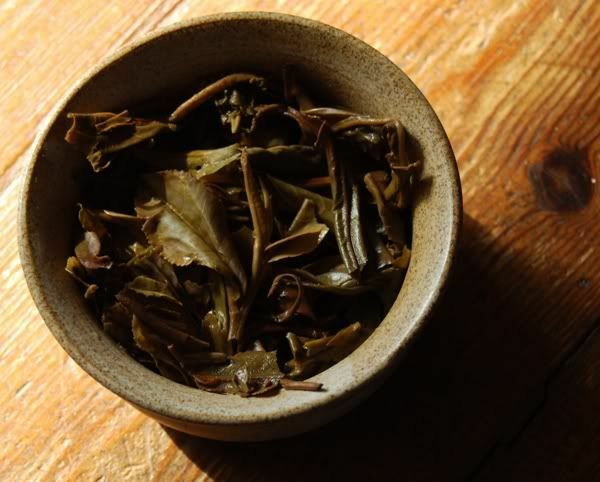 Is it not a thing of wonder that pu'er, and tea in general, can take so many forms and characters, despite being just leaf? For Xiaguan, this is quite unusual tea, being so floral. In that, they have successfully found something to differentiate this cake from all the others. However, it's not a great example - it's a bit thin, it's a little sour (though I think that's my hangover, as Lei doesn't find it so), and it has more than its fair share of plantation roughness, gripping the walls of the mouth and throat. There are some teas that, even though they are not incredible, I would be happy to own just a single cake. This Yun Mei is not one of those - I will not miss it, and will remember it only as "that slightly Nannuo cake from Xiaguan". I come not, friends, to steal away your hearts. I am no orator; for I have neither wit, nor words, nor the power of speech to stir men's blood. I only speak right on; I tell you that which you yourselves do know. Xiaguan Yun Mei: I bid you good day. 2008 Xiaguan - XY "8853"
An Easter gift from my mother (pictured below). What better way to celebrate the resurrection of Our Lord than by eating boiled eggs from a lapine cranial cavity. 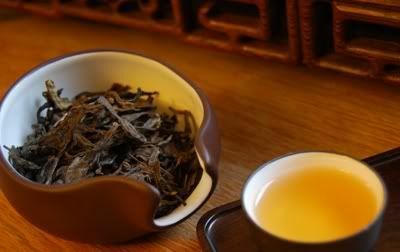 Friends speak highly of this tea, and at $22 per bing from Yunnan Sourcing, the potential for great bargainage is upon us. I am not fond of the word "redux", so let us merely say that this tea is based on the 8853 recipe from 2001. (Why 2001, and not 1988?) It feels that I have reached saturation with special Xiaguan cakes from 2008, and I have deliberately neglected my sample of this tea. Notes from friends nudged me out of my stupor, and I aim to give it a fair session. A certain "Ye Binghua" of Guangzhou is behind the "XY" label, and you may remember the 2008 XY "Big Green Tree". 'Twas tasty, with a quality akin to that of the "FT" label, also from Xiaguan. 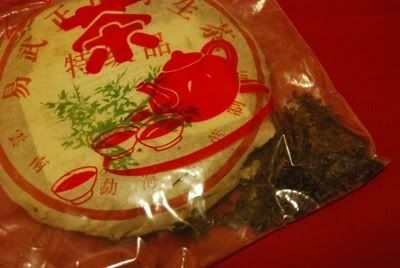 The product description records that this was made using maocha from spring 2007 and 2008. What do you think of the maocha in the above photograph? The leaves are quite small - much smaller than the "5" in "8853" would suggest. My first impression was that they were dark, and that the aroma was very solid indeed. It is pungently sweet and, in that modern Xiaguan manner, a little smoky. The sheer potency of the aroma is encouraging - perhaps there is some real content. I'm not a big fan of yanking flowers out of the ground to cheer up my photographs, and instead rely on windfalls. Fortunately, the strong winds of the English springtime, combined with heavy blooms weighing down the branches of trees and bushes, do not leave us wanting. It's at times like this that I really appreciate the feminine touch around the house brought by my dear wife, as I am entirely unconscious of such things until they crop up on our shelves and tables. 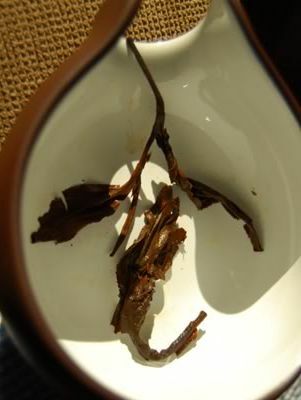 That strong aroma from the dry leaves lives on in the wenxiangbei [aroma cup] - sweet and tart. First impressions: thick. Sweet fruits to open, chunky sweetness to finish. This is solid and has plenty to get your teeth into. Wisps of the Xiaguan smokiness remain in the nose, afterwards. This is a "big" pu'er, rather like the stereotype of Californian wine. Later infusions bring development of the cereal-like Lincang character. As the leaf swells, potent the brew becomes. 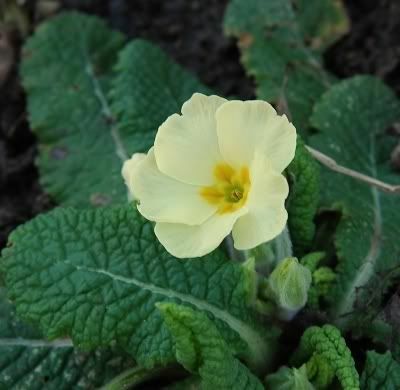 Much later, all aspects are outpaced by its goodly sweet nature. There is charm here, and out into the later infusions as is unexpected for factory tea. It is unavoidably Xiaguan, but I enjoy it, for all its familiarity. 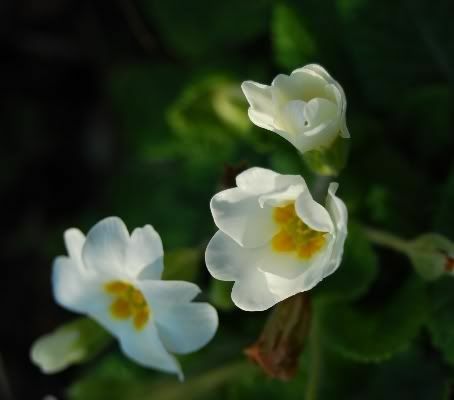 Those little leaves, shown above, carry much withal. Subsequent sessions are quite different to that described above - the tea is pleasant, but does not swell to the "big" proportions noted above, no matter how I adjust the brewing parameters. During later sessions, it seems thinner, less complex, and less stuffed full of content. I downgrade my purchasing intentions! Copious thanks to the mighty Jamus for this sample, which he discovered as part of the private collection of Scott, from Yunnan Sourcing. 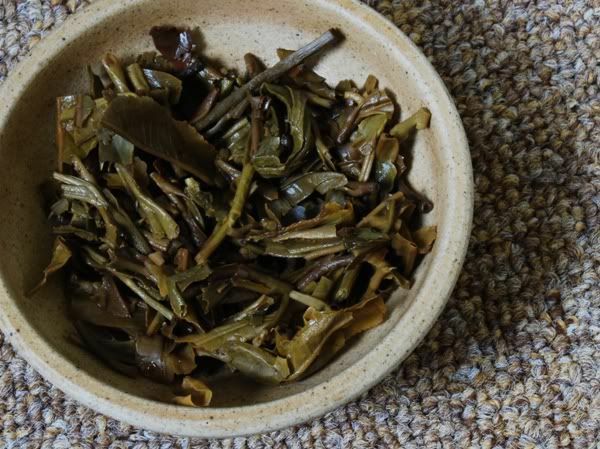 It's price at about $25 from Norbu Tea, where the vendor comments that this is a garden-grown tea from trees that are around 50 years of age. "The trees in this garden at 6,000 ft elevation on Mang Fei Mountain (7,200 ft at the peak) basically grow wild until harvest time when the leaves are hand picked." Saturday mornings, wonderful times. The week-end stretches out ahead of us, and we can sit down to enjoy some tea, safe in the knowledge that all of those "essential" tasks have plenty of time to be realised. Just, later. Much later. The leaves (above) are pleasantly green, sweet, and well-defined. It's a good start. Our tea-table is only about one foot off the floor, so we sit under it on cushions. On Saturday mornings, the sun slants through the windows and lights us up in dramatic fashion. 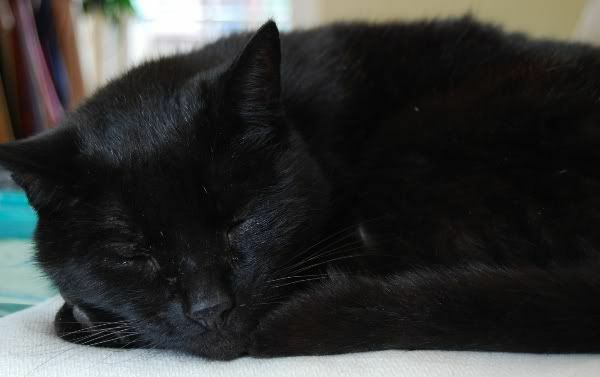 Heidu snoozes on a sofa. The music to "Hongloumeng" tinkles away on the stereo. This tea is a funny fellow. Lei loved it. She found it "delicate, like an educated middle-aged woman." I found it thin, sweet, and quite astringent. There was plenty of roughness adhering to the walls of the cheeks, and around the throat, which seemed to indicate the presence of at least some plantation leaves in this "50-year-old growth" cake. 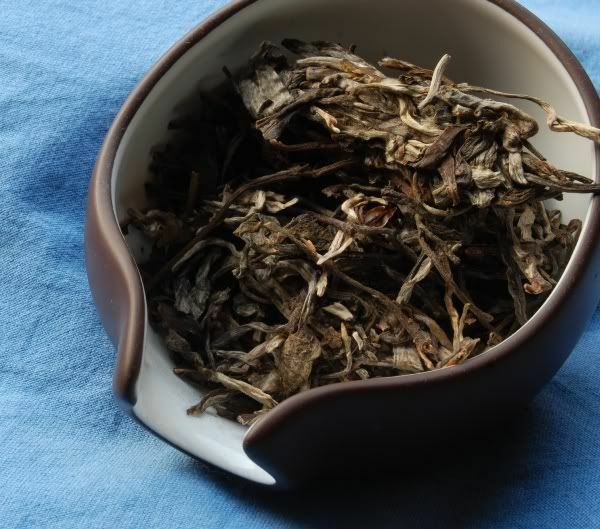 It has a pleasant, savoury base, and the astringency can be partly avoided by very quick brewing, but the results are so very thin. Altogether, a tea I wouldn't pursue, and I daresay probably isn't worth the asking price. That's in terms of critical appreciation. In terms of a good tea-session, this was a great one, and a lovely way to start the week-end. You can't argue with gongfucha. Thanks again to Jamus, who was with us at the tea-table in spirit if not in person. Along with the Seigan chawan, another member of our family arrived back in February - this fine example of Nembu-tekki [cast-ironware from Nembu, now called Morioka, in Iwate Prefecture]. For the last five thousand years, I've used an induction system, which was fine but simply too noisy, with all of its bleeping buttons and noisy fans. 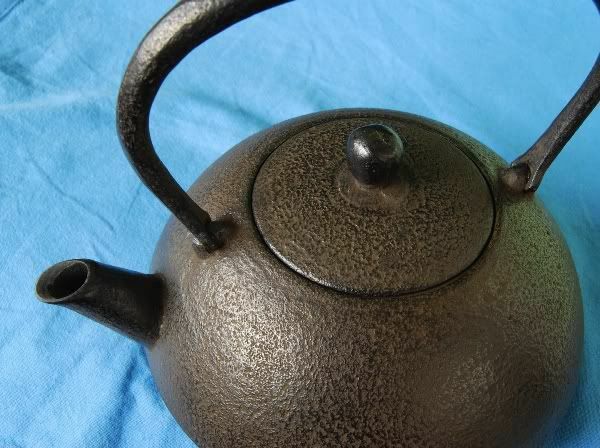 We decided to buy a traditional Japanese pot because (i) the producer (Kunzan) has been making them for over a century, and (ii) neither Lei nor I felt that we could trust boiling our water in anything metallic made in the PRC. We figured that with something as important as a water-vessel that we would use every day, it wasn't worth skimping on the money and ending up with some charming PRC-induced malady. As Lei puts it, "I respect Japanese craftsmanship, and it's not likely to kill me." 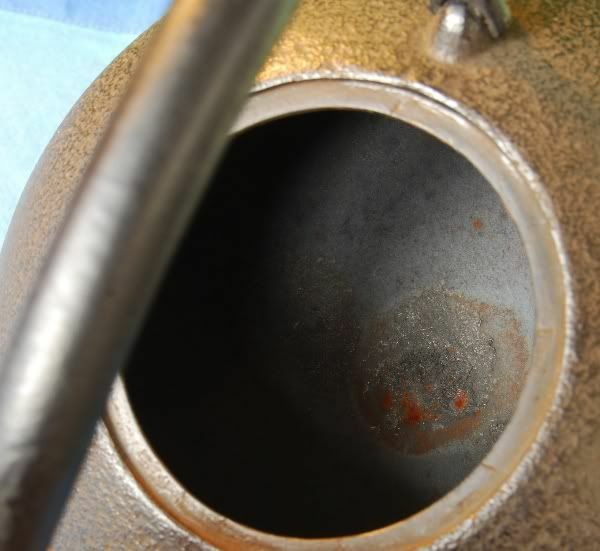 Shown above, the interior of the kettle. Kunzan finish the inner skin with an oxidation layer (a traditional non-chemical, steaming approach) that inhibits rusting. As a result, one mustn't clean the inside - which I believe is generally good advice for all iron kettles, and woks. Cleaning the interior would scrape away the upper layer of the material, and expose plenty of metal for the air to oxidise into rust. In the centre of the interior, right in the centre of the base, is the mark caused by the finishing process. Little orange spots have formed on it, which the vendor (Artistic Nippon) forewarned us would appear, as part of the normal aging process. They appeared after the second day of use, and have since remained unchanged. The mark of Kunzan is pictured above. The business has been family-run for a century, with the grandson currently installed as the head kettle-maker, with all manner of accolades from the Japanese Ministry of the Interior. We're using a hot-plate to warm it up, which makes for a very soothing (and warming!) tea atmosphere, in contrast to the technological cacaphony of the Kamjove inductor. It's gradual and slow, as opposed to the rapidity of the Kamjove, but this has actually turned out to be A Good Thing. I like my tea-sessions to go at a slow pace, and a hurried soul would find it difficult to enjoy much in the way of good tea - at least, that's how it works for me. I'll post some further experiences with the water and so on in a later article. For now, Kunzan kettles and Artistic Nippon - highly recommended. With every fibre of my being, I will this tea to be better than the 2007 Dingji Nu'ercha. This is an autumnal tea. The leaves (pictured above) woo me already, and soothe my damaged trust. They are lovely indeed, large and furry. 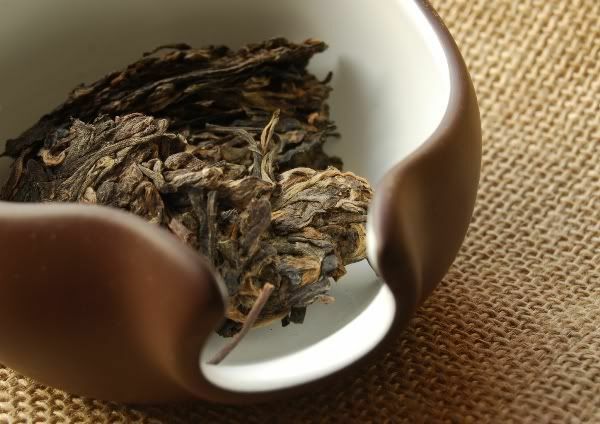 I have been put off Xizihao due to the enormous disconnect between quality and vendor pricing, but this tea tempts me back in. The aroma of the leaves is sweet and pure. Clean. Believable yellow soup, with a sweet and complex flavour - some red, processed notes, little bitterness, but a cooling and decent sensation throughout. 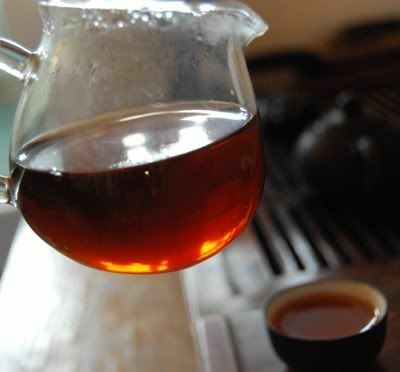 It is so very sweet, a rich, low sweetness that started in the wenxiangbei [aroma cup] and carried through into the flavour. It is worthy of the term nu'ercha, being so sweet and gentle. This is a skillful blend of good green leaves, for potency and character, with a larger portion of sweet, red leaves. 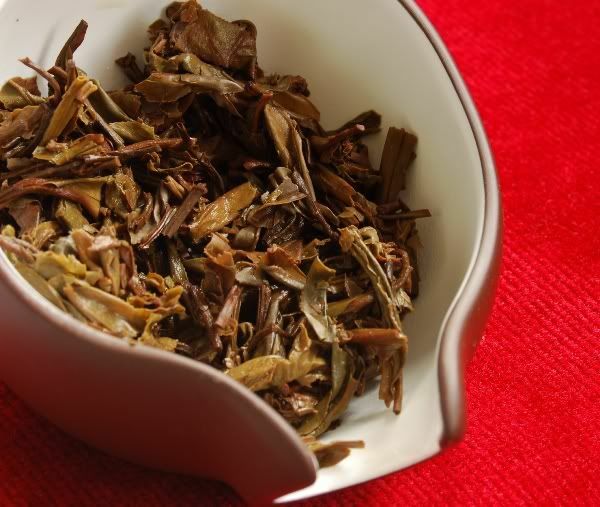 Pictured above, we can see the contrast between the pure green leaves, and the brown/red "wulong'd" leaves. This could truly be the very worst shengpu I've ever encountered. I love the quality of Xizihao leaves, and I really love some of the older cakes. Perhaps victims of their own success, they ramped up production during the pu'er bubble to unsustainable levels, and the quality dropped. They produced some delicious cakes during that period (see the Index), but also a lot of dross. However, since seeing a video interview with the main Xizihao chap, I can't help but feel affectionate towards this brand: in the interview, he was genuine, amusing, and someone I felt had got it right. I liked his attitude. From that short interview, I felt that Xizihao was a labour of love. I feel justified in judging him from one short interview, based on the words of Wilde, "Only shallow people don't judge people by appearances." Good old Oscar. I've been going back over my various Xizihao cakes and samples, lately. My priority, when looking to taste something new, is firstly to enjoy samples sent to me by friends and Half-Dipper readers. When they're depleted, I head into the samples I've bought myself. Every time I drink Xizihao, I am reminded that there is a whole world of pu'er above the major-factory lines. It's more expensive, but it can be worth the money - up to a point. I think some vendors to tend to "take the p***" with their pricing a little, particularly with Xizihao, and this problem is really evident with this particular cake. 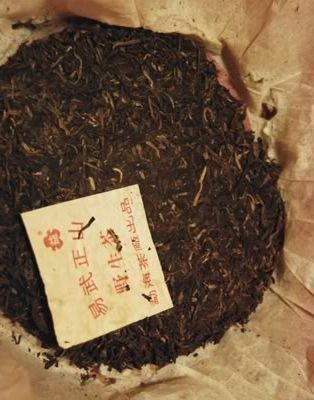 This is "Dingji Nuercha" [top-grade daughter-tea], which is sold under the mangled name of "Din Jin Nu Er". 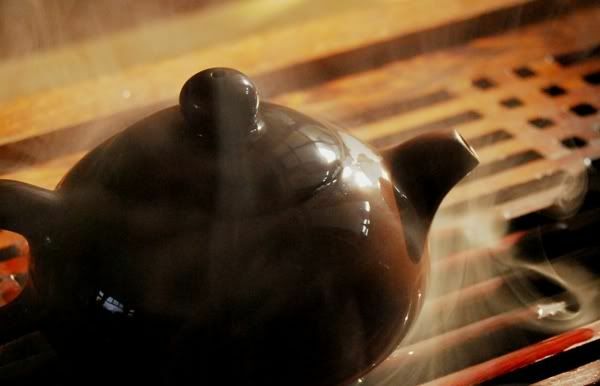 The "daughter" is an oblique reference: some say it is because the tea is gentle and feminine, some say it is because it is reputedly picked by nubile girls, some say that it is just a contrast to the "qi zi" [seven sons] name of most cakes (referring to the fact that there are "seven sons" in a tong). Practically, I take "nuercha" to mean light, fresh, and floral. Problems abound from the moment I turn out the sample: the leaves (pictured top) are a mixture of curious tan-brown and black. There is absolutely no aroma. Xizihao cakes come in two varieties: deliciously raw cakes, and highly tweaked (almost wulong) drink-it-now cakes. No prizes for guessing which this is! The soup is dark orange (shown above), and there is the most distant aroma of sweetness. In the mouth... is this pu'er? It is somehow turned, having been converted away from pu'er and towards something presumably more acceptable by the greater tea market. 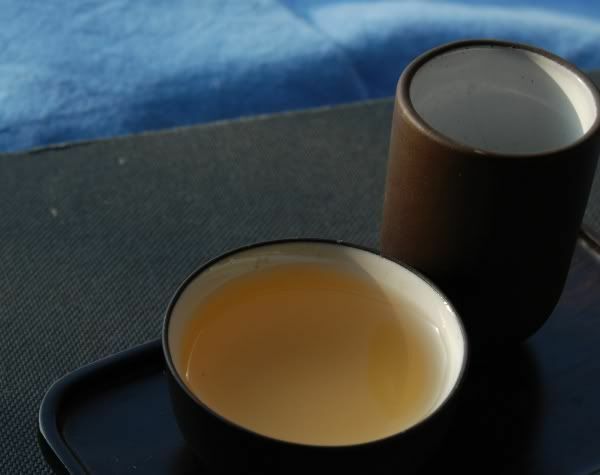 It contains no potency, some limited candy-like sweetness, and some mild hongcha notes... and that's it. I always like to get a "sanity check" on particularly good/bad teas. 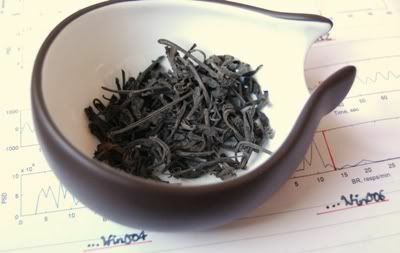 I was drinking this tea in the morning, and Lei was busily going about her morning routine. Without any information, I offered her a cup. "This is dreadful. I hope we didn't buy a cake of this! What is it?" It really is quite dreadful. That's OK - not every tea has to set the world on fire. However, this tea costs over $100 for a 400g quantity. Upon checking the vendor description, it seems that this is part of a limited run of a few hundred cakes, made to commemorate a wedding. This is perfect tea for a wedding: it has processed to such a degree that it's going to be inoffensive to everyone, from the youngsters up to Grandma and Grandfather. I must confess to feeling rather negative after considering the price, the quality, and the vendor's description that matches neither. Time to dig up some real tea! 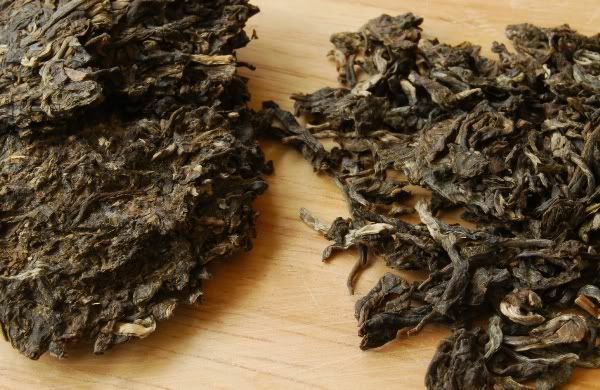 Actually, after further consideration, we remembered that there is a worse pu'er we've tried - an awful tuocha bought from a Chinese herbalist shop in Turin, though it cost just $4. Erratum: it turns out that the Turin tuocha was in fact shupu, so this Xizihao "Dingji Nu'ercha" does indeed get the title of worst shengpu! 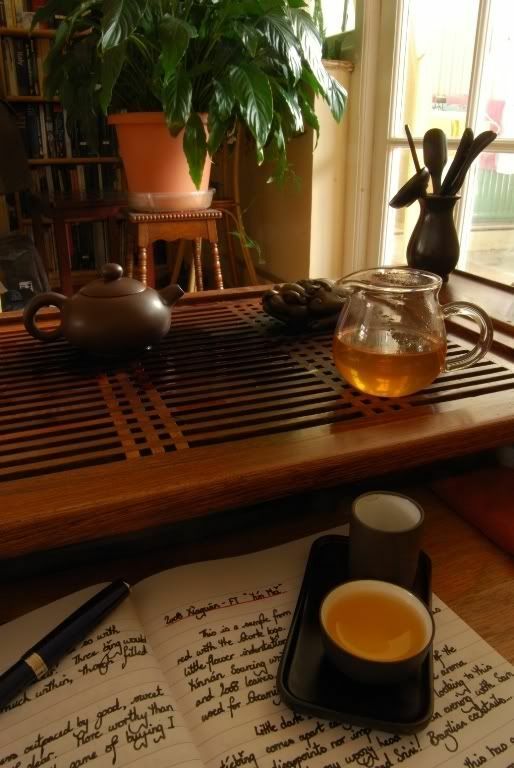 After recently reading an article on MarshalN's ever-excellent blog, I was reminded that I too haven't tried this tea for a long period of time, and that it would be good to copy over my notes for it. What better way to rediscover an old sample than with a new kettle, and a fresh palate? I rather enjoyed the 2008 Lanxiang Guyun and the 2008 Lingbo Qingdai from the same producer - though I was a little concerned that those 2008 cakes were more expensive than this 2005 cake. This is usually an indication that Scott is (quite fairly) representing the fact that the older, cheaper tea isn't quite as good as its modernday equivalents. It looks very pretty, and the stone-pressing is evident from the flatness of the leaves, and the looseness of the compression. I had to dampen the leaves in the chahe [dish for holding the leaves] before popping them into the teapot, so that they didn't break. The leaves are a bit dark... perhaps darker than one would expect for three or four years of aging. The aroma is very prominent sweetness - but low, and complex. By now, I am highly suspicious! The flavour from the first few infusions is as I remember it: plenty of unwelcome sourness in the middle, but with more interesting leathery, tobacco-like notes left behind in the nose. All over it is a sweet, baked flavour, in correspondence with that odd colour to the soup, and the darkness of the leaves. 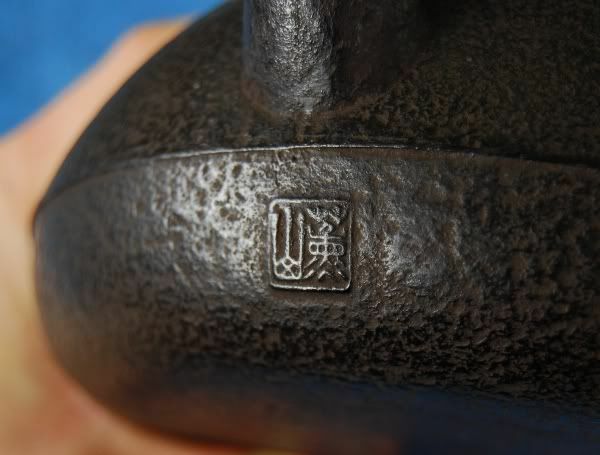 Scott mentions that it has been through the wok at its shaqing stage [kill-green, to stop it turning into wulong or hongcha], and its possible that it either imparted some of this character, or was performed too late such that it has been oxidised. As the infusions wear on, that metallic sourness fades away, and the fruity, baked character remains. It definitely becomes more pleasant, and I notice that the tetsubin water is being particularly kind to it. I associate the sweetness with that variety of pu'er that I usually (perhaps too unkindly) associate with "pu'er for people that don't like pu'er": the generically sweet, zero-bitterness pu'er produced by the Wenlong (here and here) or Yuan Nian companies. It's nice after a while... but it's too flawed to buy, I believe. At $22, it's not too much, and priced fairly - but there's plenty of other pu'er out there. 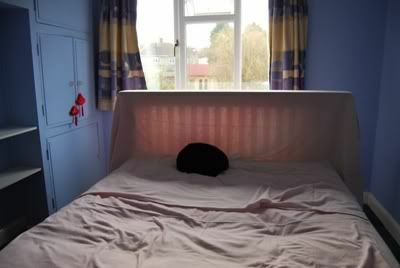 We're in the process of destroying the upstairs rooms in our house, before making a start on the destruction of the downstairs rooms. I headed up into a bedroom with my trusty wallpaper stripper to be confronted with the following sight. Oh, 70s maocha. How do I love thee? Your long, chocolate-coloured leaves are coiled around unbroken, ossified stems. 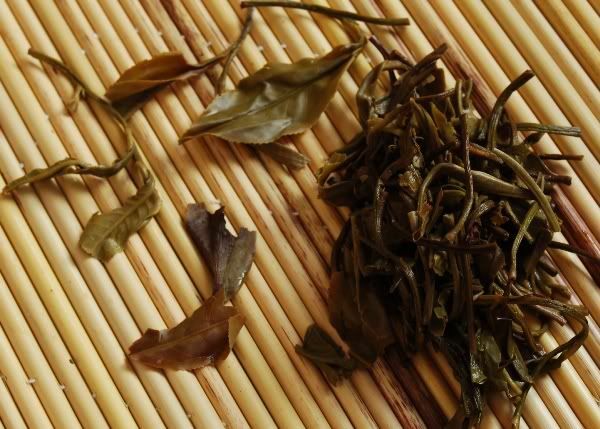 Absolutely no aroma of any kind is to be detected - but these are leaves that have drifted into deep slumber, and which awake with a powerful shicang [wet storehouse] aroma once rinsed. The orange-red brew, shown below, is a wee bit light, with nothing but that shicang aroma to be found therein. 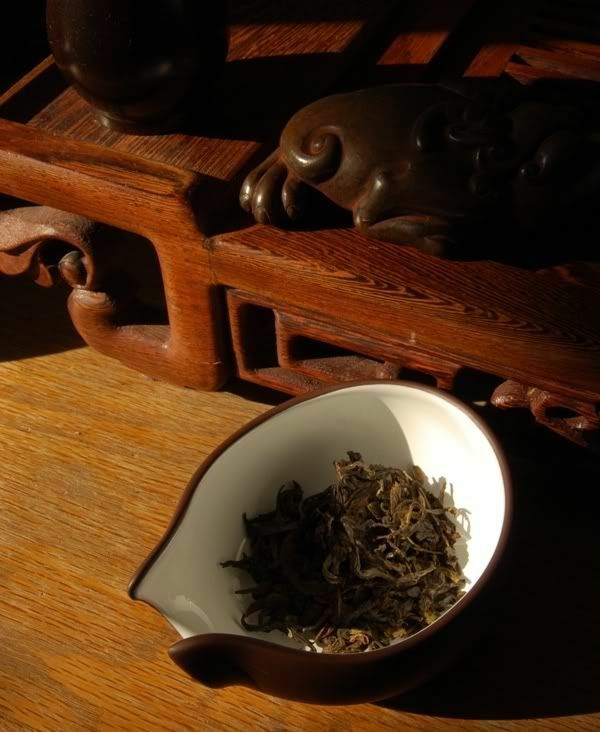 What I love about old maocha is that sultry, luxuriant creaminess. There is a mighty cooling sensation in the mouth from this old fellow, which entirely dominates the first few infusions. "This is like drinking silk." 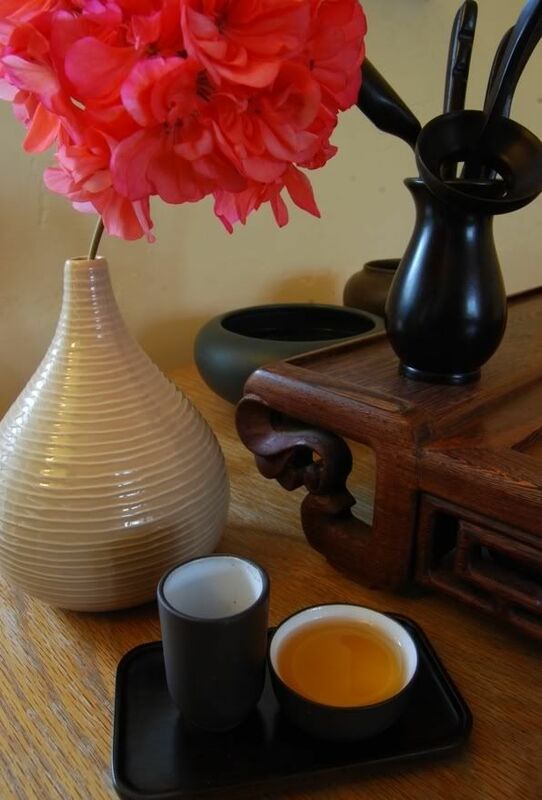 Chaqi, gentle and gradual, is eked out of the third infusion, and begins to act on my physiology. Warm, smooth, calming. 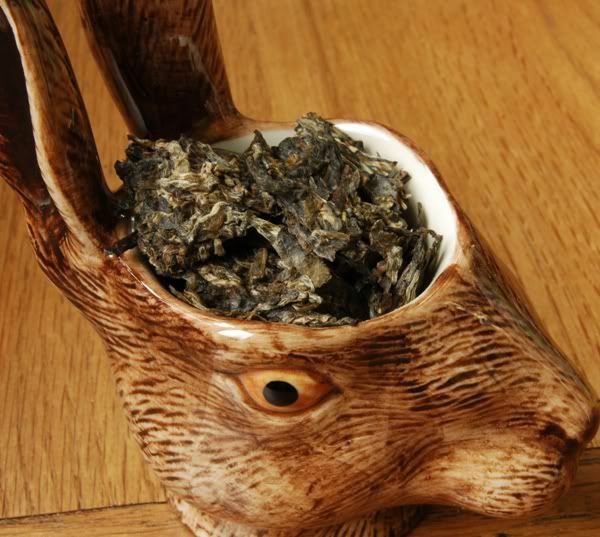 My friends are convinced that "the weird old tea you drink is narcotic." 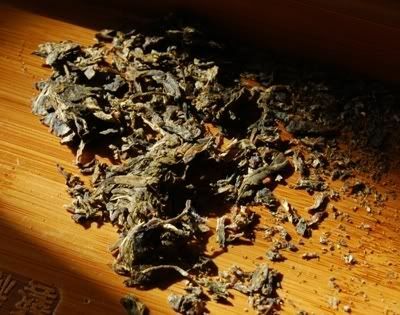 I often refer to my previous experiences with old maocha that indicates it tends to become worn out in flavour and aroma, but that the chaqi remains. This one certainly fits that pattern: it has a thick body, filled with content, but very little flavour apart from gentle shicang. It is so filled with stuff that the liquid slowly gloops its way down the glass of the gongdaobei [pitcher] - what a oenophile would refer to as "legs". This is more about that super-soothing chaqi, and the extraordinary coolness in the mouth. It reaffirms a sense of well-being, somehow, and it is easy to imagine a Chan monk enjoying this as a tonic for meditation. Delicious, in its special worn-out way. Many thanks to my mystery benefactor for this treat. Alert! The likes of Scotto, JB, and other gentlefolk have long been extolling the splendours of a 2008 Bulang brick, sold by Puerh Shop. It was about $12, seemingly, and was very nice. So they say, and I trust 'em. Mostly. Groucho Marx said that anything beginning with the letter 'k' was automatically funny, and I find the same with words that end in '-ong'. So, I confess that I was tittering like a schoolgirl while I read the description. In fact, I'm still smiling now as I remember it. Forgive me, there must be something wrong with me, as it just caused to sit back in my chair and chuckle some more. So, Bulong aside, I was very happy to see that this little fellow was back. Spookily, this product was made by the "Gujun Tea Company", whereas the advertisement for the original brick listed the "Yiwu Zhengshan Tea Co." I was always surprised that the latter was attributed to this brick, as they are the manufacturers of the Douji brand. The previously unheard-of "Gujun" company sounds a lot more believable for this product - but it does leave me wondering why the company attribution has changed. And, given that it's changed, how can this be claimed that it is a "restock"? Perhaps the answers to some questions are beyond the ken of mortal men, and "ours is not to question why". With all these questions of authenticity knocking around in my empty cranium, I was expecting very little from this tea. The wrapping is a nightmare (once opened, never resealed), and the compression is so tight that it drew blood. I still have the resulting deep wound between the finger and palm of my left hand, making it difficult to flex. I jemmied off some small leaves, pictured above, desperately trying not to break them, to avoid impending bitterness. 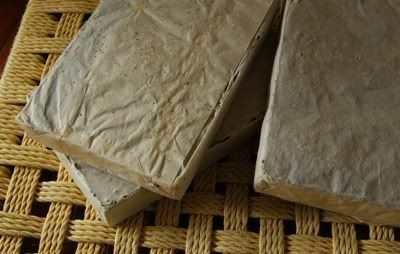 A hot but odourless beidixiang [initial aroma] turns into a sweet, sugary lengxiang [cool scent] - very pleasant. 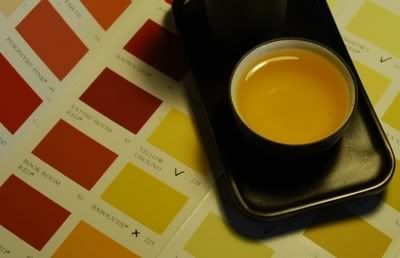 The soup comes out a beautiful, pure yellow pictured below - "Yellow Ground" or "Babouche"? My low expectations were considerably exceeded, for this is really rather nice: it has a sweet leather flavour, then a sudden rush of huigan [returning sweetness] that persists well in the throat. It has tons of potency - this is surely Bulang. I am careful with the brewing, treading softly for fear of creating a bitter monster. Overall, it is clean, potent, simple, yet really rather tasty. It remains stable throughout its course of infusions. After a long night at a friend's house for dinner, this turns out to be the perfect revivication - energising and purifying! The real name of this brick is, according to the vendor description, "Xiao Hanguo Qiaomu Chunliao Qingzhuan": Korea-market tall-tree pure-material green-brick. This obviously isn't qiaomu [tall-tree] or chunliao [pure-material], and it's a bit depressing to read such claims on a $13 brick, but it is very nice. If you like them sweet, powerful, and stable, and can cope with bleeding hands and high compression, then it's a good way to spend $13. The beauty of simple things. The wabi, in wabi-sabi. Something that is quite an important force in my life. I have a voracious appetite for reading about tea, for all my cautions to others about how real learning comes from experience, and not text. That said, I am quite picky in my reading: I have little interest in grandiosity (and have wasted quite enough money on tea-books, most of which are good for nothing but improving my compost heap), and I prefer the trenchant reporting of individuals' experiences. 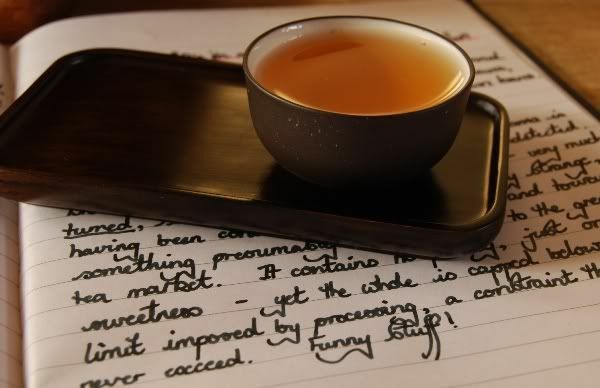 I love reading tea-blogs, tea-fora, all that body of work that others call "disposable", but which I find indisposable. There's nothing more fascinating to me than small words written about their passions, and perhaps that's why I spill so many of them here. This tea came about from such reading. It was quite some time ago, and I can't remember whereabouts it was written, but someone was reporting that they had bought some fake Big Green Tree, and that they liked it nonetheless. This caught my attention, I was impressed by their open-mindedness, and have come across some fun "fakes" myself. It is very much like finding a world in a grain of sand. So, I clicked away approximately $20 for this assumedly fake cake, from Royal Tea Garden. It looks like they still have it in stock at the time of writing, though maybe the price has risen in past months. The packing was absolutely atrocious. Really, really poor. At least one quarter of the cake had been battered out of its loose compression thanks to the lack of padding. C'est la vie - maybe that adds a little "sabi" (knackeredness) to the "wabi" (simplicity)! The wrapper was very loose, as if badly re-packaged, and I was heartily amused to see that the neifei had just been placed loose on top of the cake. Presumably, someone has obtained (or copied) a bunch of old neifei and seen fit to include them, rather than bother with all the trouble of inserting it into the cake. The great thing about not expecting much from a tea is that your expectations are liable to be met, and perhaps even exceeded. So it was with this fake: it was rough, brusque, and passingly similar to the actual 2003 Big Green Tree (thanks again to CB's tea library for that sample), but actually rather nice. The brew was thin, and it wasn't a technically sound cake in terms of huigan [returning sweetness], kougan [texture in the mouth], or yunxiang [after-aroma at the back of the throat], but it was fun. Tough, aggressive, unrefined, and rather good fun. Much more interesting than, for example, the 2008 Xiaguan XY copy. I wish I could remember where I read about this one so that I could thank them. Though one cake is enough (and heaven knows, I don't want to risk that bad packaging again), it's always enlightening to try fakes - especially fun ones, as this turned out to be. A good tea session has a certain quiet power, a method of affecting the mind in a very positive manner. This morning, I rose and plumped myself down behind the tea-table. I was full, filled with thoughts of the writing I had planned for the day, filled with the thoughts of the jobs that needed doing in the house, filled with the thoughts of the omelette that my dear wife was anticipating. Being so full, there was no room for tea. I was pre-occupied and elsewhere. The infusions passed. 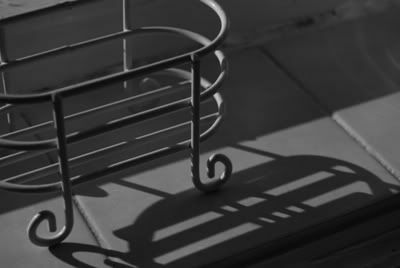 I watched tiny droplets of steam rising from the slats in the tea-tray, caught in the warm beams of the low morning sun. I wielded the heavy kettle. I wiped the little teapot. 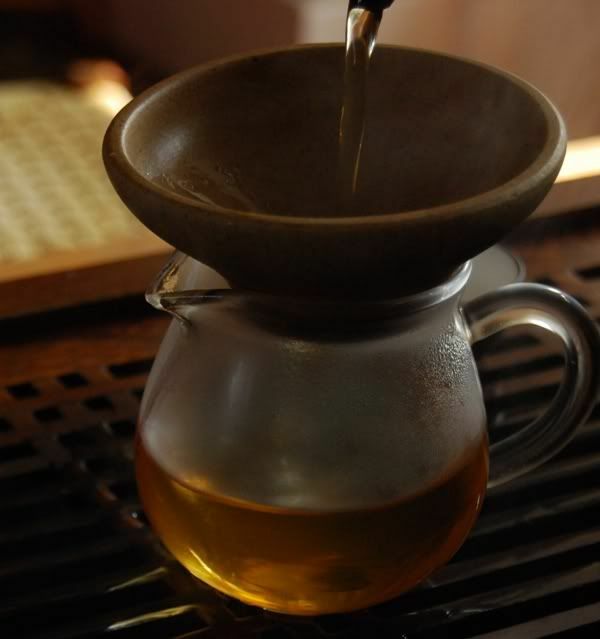 I poured into the thin neck of the wenxiangbei [aroma cup]. Before long, I noticed that I was just doing, being there, participating in moments that had otherwise passed unmarked. 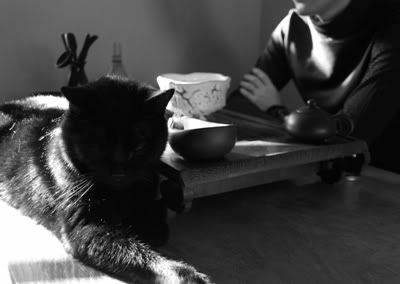 My thoughts and concerns had gone by themselves, and here I was, sat behind my tea-table. No longer elsewhere. Drinking tea is an essential part of my day. I'm not certain that it sounds entirely sensible to friends ("you drink tea? for an hour? "), but there's something in there, a little bit of magic, that just makes it somehow right. Now, how about that omelette?